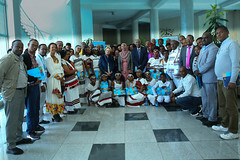 Editor’s note: UNICEF‘s Deputy Executive Director for Programmes, Ms. Geeta Rao Gupta, visited UNICEF-supported maternal and child health programmes in Ethiopia ahead of the Ministerial Conference on Immunization in Africa in Addis Ababa. At the conference, African leaders–including health and finance ministers –came together to commit to expanding access to vaccines for children across the continent. My recent visit to a health post in Ethiopia’s Bassona Worena district allowed me to see routine immunization activities, community case management and child and newborn health care programmes in action. The visit also highlighted one crucial element that characterizes successful child health programmes: community engagement. I spoke with several community health workers, including Ms. Demem Demeke, 29, who described the full range of services she provides in her one-room, neatly organized health post: “We provide promotive, preventive and basic curative health services including immunization, community case management of diarrhoea, malaria, pneumonia and sepsis, antenatal care, post-natal care and other services to our community.” With handwritten charts plastered across the walls, Ms. Demeke was able to tell me exactly which households in her area had children in need of immunization, and with folders organized by the day of the week, she knew which children were due for a vaccination on that day. I watched as she expertly vaccinated a baby boy and then comforted him and instructed his mother on his care – quality, personalized care provided right there in a remote village in rural Ethiopia. I was very impressed by professionalism and strong sense of responsibility of the community health workers. By engaging the communities they serve and working in partnership with the leaders in the Health Development Army they create a high level of ownership and a conducive environment to address traditional practices, cultural beliefs and social norms that contribute to hesitancy or even resistance to vaccination. The trust they build also helps to identify and reach children who are the most vulnerable — children who might otherwise never benefit from health services. 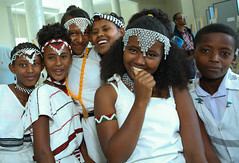 UNICEF/UN010923/TesfayeMs. Geeta Rao Gupta, accompanied by women in the community on her visit to model household in Bassona Worena District, North Shewa Zone, Amhara Region, Ethiopia. Ethiopia’s 38,000 health workers are mainly women selected from local communities who are paid by the government as part of the country’s flagship health extension programme. With the help of these committed women Ethiopia has expanded access to and demand for essential health services like immunization, making significant gains in reducing child mortality in less than a generation. 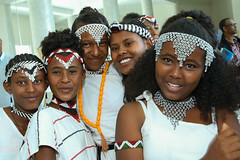 By leveraging community engagement for child health Ethiopia reduced under-five mortality by two-thirds between 1990 and 2012 meeting Millennium Development Goal (MDG) 4 ahead of schedule. Community involvement is a common success factor among countries that are reducing the prevalence of childhood diseases, particularly those that can be prevented with vaccines. Engaging and involving communities directly through community health workers and champions within communities is among the most effective means of promoting immunization in rural or marginalized populations and contributing to broader health goals. At UNICEF, we have learned that lesson well over the years, most recently through our efforts to eradicate polio in Africa and elsewhere. Involvement and engagement of community leaders by community health extension workers transformed those efforts leading to increased success in reaching vulnerable children previously missed in polio vaccination campaigns. Despite this experience and evidence, in far too many African countries today, consistent, nation-wide investments in community health programmes are still the exception – not the rule. To maximize the return on investment in immunization programmes and to strengthen overall health systems, Ministries of Health should allocate adequate resources to support community-based health workers working hand-in-hand with community networks. By educating communities and generating demand, community health workers are key to expanding coverage and sustaining demand. And when community health workers involve community members in planning and monitoring the quality of services, it boosts community ownership, acceptance and accountability – cornerstones of effective health programmes. During my visit to the health post in Bassona Worena, I was privileged to personally witness what the power of a partnership between a government health system and communities can achieve. With communities by their side, governments can succeed in reducing child mortality through quality and equitable health programmes, allowing children everywhere to reach their full potential. Community health programmes characterized by the full engagement and involvement of communities must become the norm across the African continent. UNICEF stands ready to assist. It is one of the most effective ways to make the right to health a reality for all children. Geeta Rao Gupta is UNICEF‘s Deputy Executive Director for Programmes.